Walls are blank canvases with the ability to lift up your spirits, once designed and painted well. Though no color is a bad choice for bedroom, it is advisable to go for cool and soft colors like cream, light pink, blue and beige. These colors have a calming effect and don't interfere you’re your sleep. 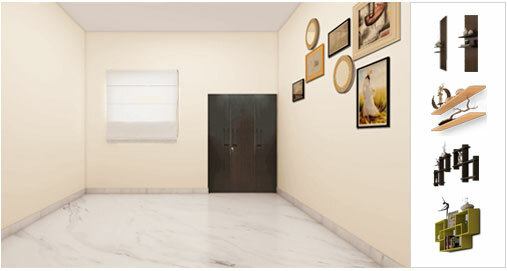 You can also apply trendy wallpapers or subtle vinyl stickers to give a dramatic look to the space. It is advisable to put only selected furniture in the bedroom. Putting up a lot of pieces makes the space look tiny and suffocated. A king or queen sized bed with upholstered mattress and comfortable headboard can be a good choice. If you are short on space then you can also for convertible beds or ones with the option to store. 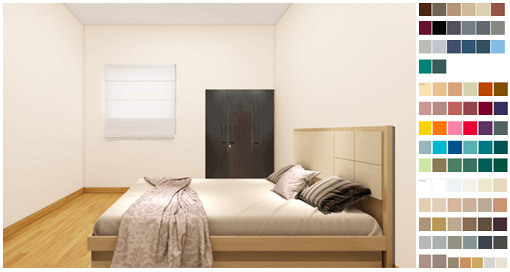 The placement of the bed is also important and can be kept in the center against the wall. The side tables should be in proper scale with the bed. If you are planning to add a wardrobe to the room than choose the one that blends well with the other furniture items and is sleek in design. 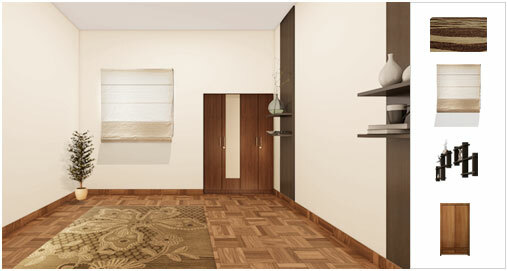 To give the room a bright and spacious feel, you can add large mirrors to the wardrobe. While selecting the furniture pieces like bed or side tables and Ottomons, do ensure that they fit the space well while leaving ample of space to move around. Our bedroom design can help you to visualize furniture in your bedroom like environment to ascertain whether they are a fitting choice for the room or not. The first thing that you see, once you break away from your sleep is your room's ceiling. Thus, it is important that it appears pleasing to you. While picking a false ceiling for your bedroom, take care that it fits well, and is at a suitable height from the floor. You can take the help of meter tape to get the approximate size of the ceiling needed at in your room. 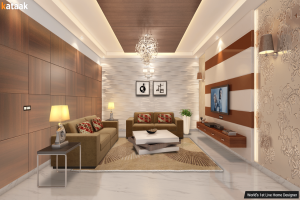 Otherwise, you can also visualize multitude of false ceiling options real time in an environment similar to your room in both size and décor to find the fitting choice. 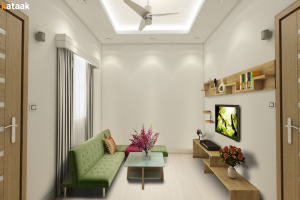 If you are planning to use false ceilings that come with light fixtures, then ensure that the glare doesn't fall directly over the sleeping area. 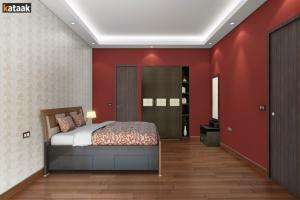 Flooring is a significant part of the bedroom. You wish to have a sense of warmth when you make your first step over it in the morning. Therefore, it is a good idea to go for wooden flooring than marble or tile as the former has an inherent cozy and affectionate feel attached to it. 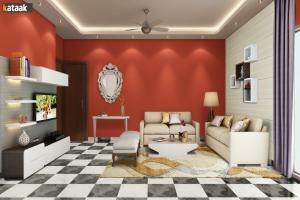 If engineered you find this option expensive then can pick tile or marble flooring, but get the area carpeted. 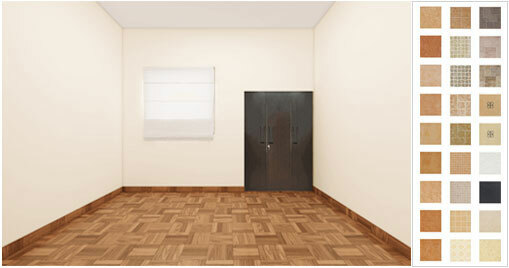 Another affordable suggestion for bedroom flooring is vinyl flooring. They are highly durable and less prone to moisture heat and scratches and are easy to install. 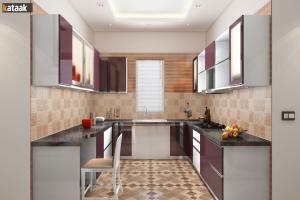 They come with a wide range of options in terms of designs, colors and quality. Perfectly contrasted furnishings work wonders for the bedroom. 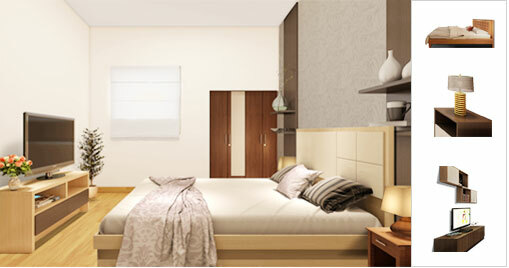 Pick curtains and beddings that reflect well with the room's wall color and furniture. You can do so by using our tool Kataak that lets you visualize home décor in a real time environment. Beautiful wall décor is essential for the bedroom. A classy piece of artwork above the headboard gives the space a dramatic feel. Otherwise, walls can be decorated with floating shelves where one can place display decorative items. Make sure they are in minimal quantity and away from the sleeping area as they might drop down over you. 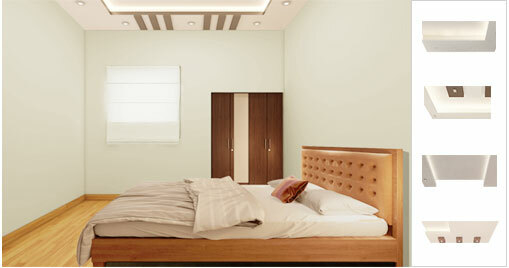 If you have a query or concern while decorating your bedroom, then you can write to us at info@kataak.com. Happy Bedroom Decorating to you ! Bedroom, your very own and private slumber zone comes in all shapes, styles and sizes. So how do you design your own? Confused? 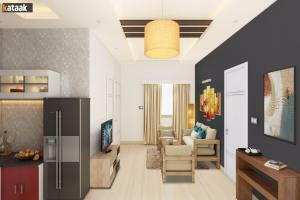 We at Kataak- World's Ist Live Home designer is all there to help you, from the scratch. 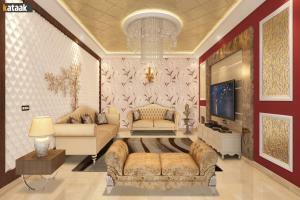 We are an online home decor platform that lets you design, furnish and decorate your home online. 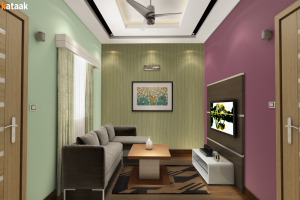 Start by choosing the appropriate room size of your bedroom and play with multitude of options across wall paint, wall decor, furnishings, furniture, ceiling and a lot more to create your dream design. 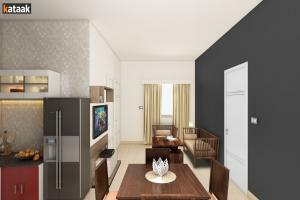 With our tool, the perfect amalgamation of professional interior designing and technology, bedroom interior decoration and designing is a cakewalk. Keep your expenses in check as our tool comes integrated with a price meter that displays the approximate price of the design, detailed to the price of individual products. Save or share designs across Social Media and Email with your loved ones and take their opinions to create the bedroom design that will be loved by all. But our work doesn't end here. 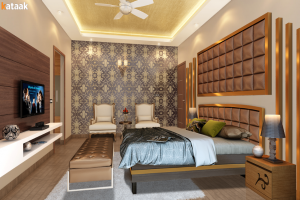 We help you get your bedroom interior design executed by connecting you with our handpicked team of interior designers, Compare profiles and bids to get your project executed by the best of the people in the industry at the best of the prices. What are you waiting for? Isn't it time to create the bedroom of your dreams?